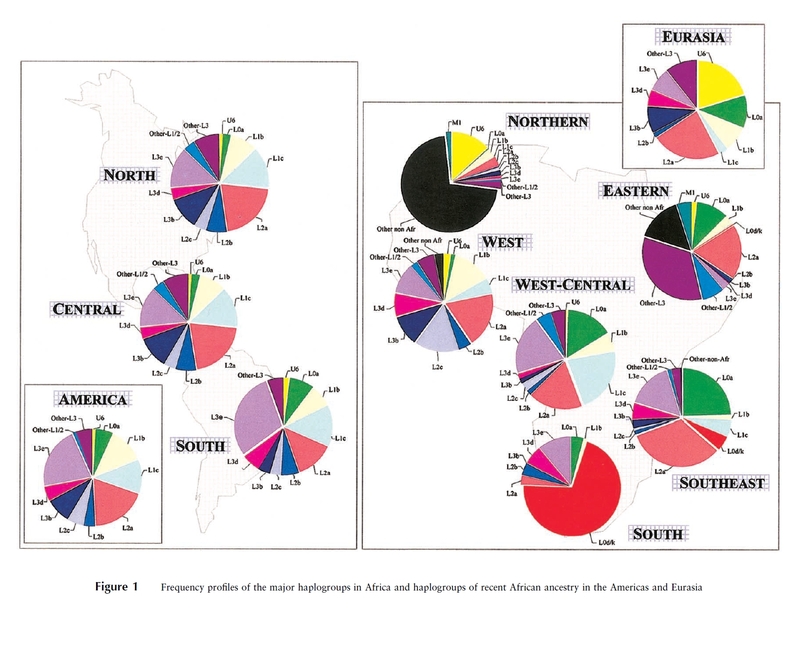 In this blogpost i will be reviewing two scientific papers dealing with the haplogroups identified among several Afro Diasporic populations and correlating their frequencies with possible African source regions. From these two studies the first one is the oldest and perhaps also least surprising in its reported outcomes. Because of limitations of available sampling in 2004 it also covers less populations. The second study provides a far more detailed overview, incl. Cape Verde & São Tomé & Principe!, plus a more historically refined yet still debatable explanation for its results. Despite several shortcomings this study offers a fresh perspective in sofar that it attempts to provide a more intraregional resolution for African origins, incl. ethnolinguistic ones! So i will start my discussion with this most recent and arguably more relevant study eventhough the first one was quite pioneering at the time of publication. Below figure shows a good overview of how the main findings of both studies are actually still quite comparable. In accordance with slave trade records (see this page for screenshots from the Slave Voyages Database) West Africa is being shown as predominant for both the USA and the Caribbean while Brazil and Colombia show a greater share of Central & Southeast African. All countries however show a mix of African source regions. Igbo, the 171 Nigerian samples being mostly from northern Nigeria, with only 31 Yoruba’s from southern Nigeria. Congo, the 62 DRC samples being mainly Mbuti Pygmies (52). Resulting in a disproportional share of Upper Guinean samples (Senegal, Guinea Bissau & Sierra Leone) as compared with Lower Guinean ones (Ghana, Benin, Nigeria). While the historically lesser important source regions of Cameroon & Gabon are overrepresented to an even greater extent (combined providing almost 2000 sequences out of a total of over 5000!). Another thing to keep in mind is that the Afro-diasporic groups might show regional variation (substructure) within their populations which might be misrepresented by the sampling for this study. For example just like African Americans from South Carolina & Virginia might show a somewhat distinct ethnic/regional mix based on their specific slave trade patterns, also within Brazil (e.g. Bahia versus southern Brazil) and Colombia (e.g. the Pacific coast versus Cartagena) there might be regional differentiation which is not being specified in this study. Of course all of this is because of understandable reasons of available sampling, however it’s good to be aware of these limitations of the database as it may explain some peculiarities in the results shown below. Going by a 3-way division (West, West-Central, Southeast) the results are not really shocking however when zooming in to greater localized detail we do see some unexpected and perhaps questionable outcomes. It’s interesting to contrast above findings (based solely on a comparison of mtDNA sequences from a limited database) with documented slave trade numbers for all the countries mentioned. If you click on this link you get the same query variables i used in the Slave Voyages Database. I used Cartagena as a proxy for Colombia (named Spanish American Mainland below) and Caribbean is made up solely of the 6 Anglo-Carribbean islands covered by this study: Dominica, Grenada, St. Kitts, St. Lucia, St. Vincent, and Trinidad (Stefflova et al., 2011, p.7). Cuba is shown separately in the second chart. Mozambique is shown for Brazil & Colombia, however it’s only Brazil that received a notable share of captives from Southeast Africa, 7% according to documented slave voyages. The Colombian findings are unaccounted for and might be suggestive rather of other Bantu speaking origins. Furthermore Cuba is shown with no Mozambique eventhough according to recorded slave trade history about 10% of all its slaves could have been hailing from there. Higher even than Brazil! Perhaps this lack of Mozambique reporting is caused by limited sampling from Cuba.The outcome for USA & the Anglo-Caribbean is compatible with the records. Actually for the USA a small % was detected as seen in the very first chart on top of this blogpost. Angola is most noticeable for Brazil as expected, also the %’s for the USA and the Caribbean are roughly in line with slave trade data for West-Central Africa although a bit overstated for the Caribbean. The Angola sampling was also done in Cabinda so it would contain Bakongo samples i suppose. Both Cuba & Colombia are shown with no Angola matches at all, this is contrary to widely documented evidence of Angolan presence in both countries. Again perhaps a local sampling issue. Cameroon is mentioned twice, its huge samplegroup being split up according to linguistic background. The Bantu speaking Cameroon samples seem to match especially with the USA & Cuba. I suppose this might be in line with Bight of Biafra origins and also in absence of Igbo samples it could be the next best thing. Although it’s surprising then that the Anglo-Caribbean are not shown with any %. Gabon & Equatorial Guinea are matched up with Brazil and Colombia. This is being covered by the almost 45% West-Central African slave imports for Colombia and almost 60% for Brazil. However these very sparsely populated countries are not known for having had any major share in Trans Atlantic slave trade. So most likely this outcome is caused because of the absence of Bantu speaking Congolese samples. Upper Guinea (Guiné Bissau, Sierra Leone, Senegal, Mali) is the only region which shows matches with all the Afrodiasporic populations. The percentages are clearly inflated though, possibly because of the absence of Lower Guinean samples (Ghana & Benin). Or else perhaps because of a founding effect reflecting the earliest wave of Upper Guinean slaves. Brazil only had a noticeable Upper Guinean slave trade in its northern states (Maranhão) otherwise it was neglible (below 3% according to the voyages database). Colombia and especially Cartagena actually did have a very significant input of Upper Guinean captives, dating mostly from the 1500’s/1600’s. The mtDNA % could still be inflated (63% versus 38.7%) however it seems correct that Colombia is shown with the highest share of Upper Guinean mtDNA matches. For Cuba, the USA and the Caribbean it’s difficult to disentangle any genuine connections with Upper Guinea. Niger/Nigeria/Cameroon is based mostly on Chadic and Volta speaking samples from the north. It might perhaps capture some connections with interior slave trade in these countries. However since the sampling from southern Nigeria was rather lacking in this study it could again represent a rather misleading picture. As also to be seen from the quite high %’s for almost all Diasporans. Colonial control along the African coast was very relative and restricted to a few European forts up till the age of Imperialism, and this period only started after the abolition of slave trade! The map above is misleading therefore as it shows the situation in the Americas circa 1763 but in Africa it looks rather like a depiction of the situation in the early 1900’s (post WW1)! Untill the late 1800’s when European Imperialism got started the slave ports along the Bight of Benin or the Slave Coast were always under local African control and visited by all European slavetrading nations. The same goes for the slaveports along the Bight of Biafra although here the English buyers did indeed predominate (at least till 1807). But not so along the socalled Loango coast, to the north of Angola, which was visited in near equal measure by English, Dutch and French traders during the 1700’s. In Upper Guinea and along the Gold Coast there were more European forts already in the 1600’s however they were under control of several slave trading nations (England, France, Netherlands and Portugal), so again not the exclusive domain of just one colonial power. Mozambique and Angola (Luanda and southwards) are perhaps a more convincing case. Portuguese control of the coastal areas was somewhat more tighter here but again not perfectly so. And even here there’s been reports of contraband trade by especially the French in Mozambique. Also the Portuguese were an important supplier of slaves to the Spanish colonies within the Americas. Just like the English, Dutch and to some degree also the French engaged in extensive intercolonial trade which clouds a straightforward overview based on the Slave Voyages Database. This much is alluded to by the authors when discussing Colombia however it seems again they simplify things by not mentioning how the English and the Dutch took over the Asiento in the late 1600’s from the Portuguese. Their explanation for the surprising Mozambique score of Colombia as a result of a supposedly late Portuguese slavetrade seems unconvincing therefore. Their discussion of the Brazilian results is more in line with known slave trade history but they skip over the fact that Brazil is known to have imported far greater numbers from the Bight of Benin (which was not under Portuguese colonial control!) than from Upper Guinea (Stefflova et al., 2011, p.7). Another aspect not mentioned by the authors is the impact of post-slavery migrations interfering with a straightforward interpretation of documented slave trade patterns. The study reports a rather high Upper Guinean percentage for São Tomé but fails to mention that in fact a considerable proportion of its population is consisting of relatively recent migrants from Cape Verde, who arrived there in the last 100 years or so as socalled contract labourers. It might very well be that they or their descendants were disproportionately among those sampled for São Tomé, which is a reminder of how samplegroups are not always per se representative. ” A different distribution of African ancestry was observed in Philadelphia, a former British colony. The ancestry of African Americans from Philadelphia draws its mtDNAs mainly from the Bight of Biafra and Benin regions (37% Nigeria-Niger-Cameroon and 15% Cameroon Bantu in Philadelphia compared to 25% and 14% in the US overall, respectively). Ancestry from Guinea Bissau-Mali-Senegal-Sierra Leone predominates in other United States African American populations compared to Philadelphia alone (43% vs. 22%). Despite the differences in coverage and sampling, this pattern may be attributed to a significant contribution of slaves from British colonies in Africa to the British-controlled Philadelphia region compared to a more diverse contribution to other parts of the United States from French, Spanish, and Dutch colonies.”(Stefflova et al., 2011, p.7). I’m again not really convinced by this argument they are proposing to explain the differences between Philidelphia and the rest of the USA. It’s generally known that the slave trade to the USA was carried out overwhelmingly by English and American owned vessels. The combined share of French, Dutch and Spanish trade, even with Louisiana and Florida included, amounting to a mere 3% of the total slave trade to the US according to the box in the lower left corner of this chart. I suspect it’s rather differences in regional preferences and timing of slave trade to Virginia & the northern States versus South Carolina which might explain the results, especially those for the Gullah. However both the domestic slave trade and post-slavery migrations by African Americans across the USA might again complicate a straightforward correlation. Even more intriguing for me personally is the way Cape Verdean’s breakdown is being shown as 100% NorthWest African, incl. a minor share of Mauritania. Not too surprising given it’s geographical location however still an important confirmation. 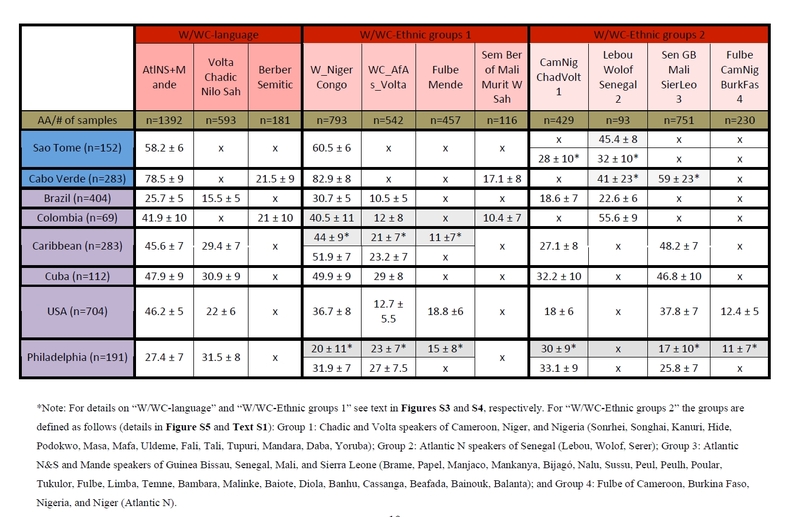 The authors of the study appply three different methods for specifying the West African portion, in all cases the sum of the breakdown will correspond with the total of W/WC geography in the very first chart posted on top of this blogpost. Only for Cape Verde it will be 100% therefore. It’s noteworthy that besides Cape Verde only the Colombian samples show any affinity with Berber/Semetic mtDNA. Perhaps a legacy of the early slave trade connections between Cape Verde and Cartagena (see “Shared Upper Guinean roots between Cape Verdeans and Latin Americans“). In the first breakdown according to language it’s again Cape Verde and Colombia and also São Tomé which don’t score any % for “Volta/Chadic/Nilo Saharan” which quite possibly acts as a proxy for Lower Guinean origins. In the second breakdown of “Ethnic groups 1” it’s notable how only the Caribbean and the USA score any % for Fulbe/Mende, the Fulbe samples being taken from Burkina Faso, Cameroon and Chad and the Mende from Sierra Leone. In the third breakdown of “Ethnic groups 2” it’s fascinating how the Senegalese ethnic groups of the Lebou and Wolof are only appearing for Cape Verde, São Tomé, Brazil and Colombia. The USA is however unique in being matched up with the Fulbe from Cameroon, Niger and Burkina Faso. The findings of this study from 2004 are mostly speaking for themselves so i will not bother with much commentary. Except that eventhough the outcomes might not be that surprising it’s still important that this kind of confirmation of slave trade data is being reported (based on mtDNA). Also the inclusion of Dominican samples for “Central America/Caribbean” might be noteworthy. nor are the eastern African haplogroups, L1e and L1f. Columbia, and 37 Garı´funa from Panama and Belize (A. This entry was posted in African Americans, Anglo Caribbean, Brazil, Cape Verde, DNA Studies, Hispanic Americans and tagged mtDNA. Bookmark the permalink. I was literally just reviewing these same articles, specifically the “…within Africa…” article. Always, always – THANK YOU for imparting such invaluable analysis. Thank YOU as always for the appreciation! I actually knew about the “Dissecting the Within-Africa Ancestry” paper for a few years already. It’s always been one of my favourite papers inspite of the shortcomings i’ve been discussing. I applaud its Afro-Diasporic approach, focusing not only on a few groups but attempting to cover the whole range.